Life in Ireland has changed dramatically over the past eighty years. In 1938 the Irish population was less than three million. Just half the population was connected to the electricity network, and less than one in ten households had radio licenses. Cars were still a rare sight on the roads, with bicycles instead the more common form of transport, back then a new bicycle cost £5! 1938 was a significant year for the fledgling Irish state, with Ireland’s first president, Douglas Hyde inaugurated in June and the 20,000 seat Cusack Stand opened in Croke Park in August. It was also a significant year for Irish Cement as on 23rd May 1938, Sean Lemass, then Minister for Industry and Commerce, officially opened the cement factories in Drogheda and Limerick. That was the culmination of a concerted effort to develop an indigenous cement industry. In 1933 the Cement Act was established, which provided the legal framework for the formation of a cement industry in Ireland. 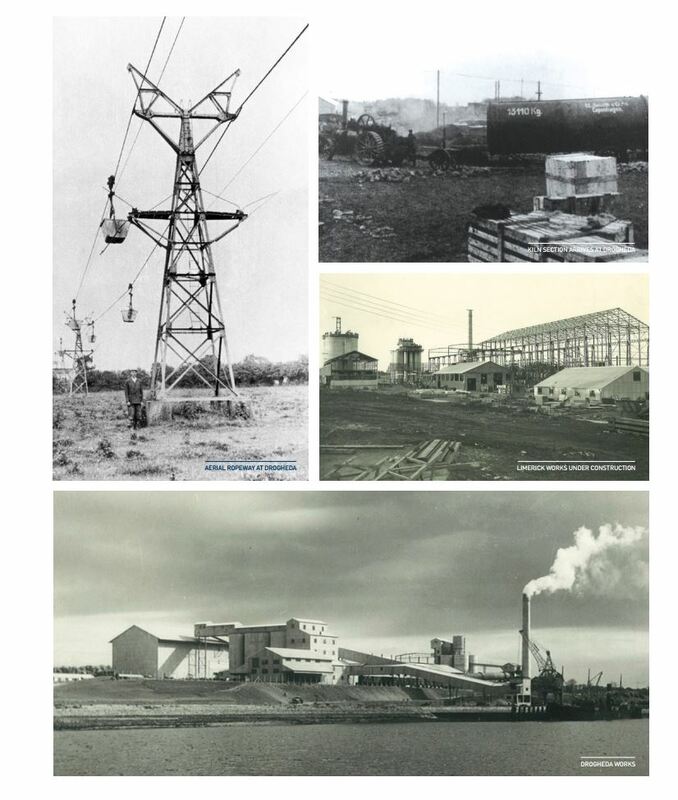 In 1934, the State approved the first cement licence and in May 1936, Cement Limited was registered as a Limited Liability Company and the two cement factories were established in Limerick and Drogheda in 1938. Cement Limited and Roadstone Limited merged in 1970 to form CRH plc. In December 1978, the name ‘Cement Limited’ was changed to ‘Irish Cement Limited’ to reflect the long history of indigenous cement manufacture at the two factories and to more appropriately brand the Company and its products as being 100% Irish. Irish Cement today has a skilled workforce, operating two modern energy-efficient cement factories in Platin and Limerick which manufacture high quality cement for the construction sector both in Ireland and in export markets. The company continues to modernise and adapt both factories to reflect best practice and technology to meet our customers demand for high quality products and ensure the long-term sustainability of the operations. The development of our modern way of life in Ireland is closely linked to the improvements in housing, transport and infrastructure, where cement and concrete continue to play a vital role. Irish Cement rightly remains proud of this close association over the past eighty years with the development of our modern Irish economy. Irish Cement is well positioned to continue to supply our customers with high quality cement and technical support as Ireland builds its future.